Anambra State with a National Diploma in 2010 has told the story of the horror he passed through in his bid to reach Europe through the Sahara desert and North Africa. 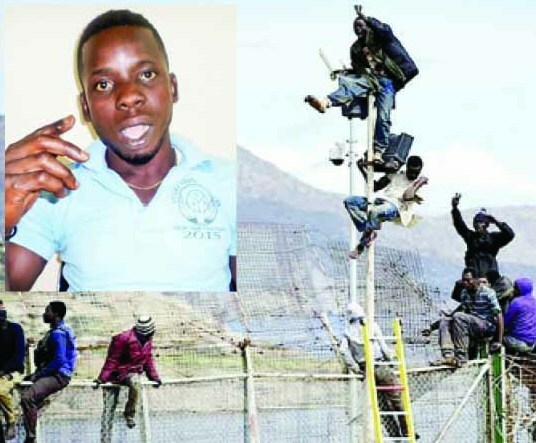 Iloh, who could have continued his studies to acquire the Higher National Diploma (HND), said paucity of funds prevented him from pursuing the higher qualification in what he studied. Determined to help improve the lot of his family, he began nursing the idea of going to Europe. His excitement grew when some members of his family during family gatherings cited the cases of some other people within their community who had succeeded abroad. As if his intention was beginning to materialise, his brother made contact with a certain female herbalist (name withheld) from Niger Republic resident in Enugu. The lady, Chinedu said, acted as an agent and facilitated travel plans for people willing to take the risk of crossing into Europe by undertaking the perilous journey from Niger Republic, Algeria and Morocco before making the short hop into Europe at the tip of the border between Morocco and Europe. The lady, who operated the business with the assistance of her son, Sali, met with Chinedu’s family and sealed the travel deal with the initial sum of N350,000, which the family paid after borrowing the said amount from friends and other associates. But unkown to them, they were letting themselves and Chinedu’s fate into the hands of human traffickers, who paraded as genuine travel agents. When the journey set off, what Chinedu saw left him devastated. With tears cascading down his face, he narrated to Sunday Sun his horrible experience in the desert where he drank women’s urine for six days to quench his thirst. Several of his migrants died at various points in the course of the trip. In his own words, he narrates the experience…. It was my brother who established the connection with one woman from Niger Republic, who claimed to be a herbalist and also arranged trips to Europe through her home country. She lives in Enugu at the army barracks. She told me that her daughter was in Libya and promised that if I would undertake the trip with her assistance, her daughter in Libya would take care of me when I got there. I immediately went to IMT Immigration Office and secured an international passport. The woman demanded N350,000 and said it would cover the cost of the trip from Libya to Europe. I had no prior experience of travel outside the country but I was desperate to change the fortunes of my family. My family raised the sum of N350,000, which was paid to her. After receiving the money, she sent for her son, Sali, who, contrary to our agreement, took me to Niger Republic. We spent N100,000 in the course of this journey. When we got to Niger, Sali introduced me to some Nigeriens who spoke a different language. On the night of our third day in Niger, Sali told me that he would go out to buy food for both of us. I gave him money to buy the food. Meanwhile, I was with the Nigeriens he introduced me to before going out. I waited for him for hours before I decided to go and look for him at the place where we once went to eat. But as I was about to go out, the Nigeriens restrained me, warning that the police would arrest me as I had no papers. Two days later, I called my brother and told him that Sali had abandoned me. He sent me N20,000 from Nigeria. Meanwhile, the Nigeriens said I should strike out on my own. I summoned courage, moved out and met some Cameroonians who were also abandoned. But they knew the route better than me. It was the Cameroonians who helped to collect the money sent to me by my brother. They took me and we boarded a vehicle called “Combine” which was supposed to take us to Algeria. They collected the money from me to buy jerry cans, garri and other supplies we would need for the journey. About 48 of us were packed in the vehicle like sardines. When we got to a place called desert, the driver said he did not know the route again. We slept there for three days. The driver and his assistants forcefully collected the garri and water, which we bought and gave to the girls they brought from Nigeria, who they planned to traffic outside. If you tried to protest, they would beat or even kill you. At a point the water finished and we now relied on urine from those girls. If a girl liked you, she would urinate and ask you to drink as she was doing so. Imagine trying to drink water from a running tap. Considering that the girls had not had their bath for days, you can imagine the sanitary state of their genital region. But we had no choice, it was that or death from thirst. On the fourth day, the Nigerien drivers said everybody should go their way. We were stranded and slept there for another two days. We were only drinking urine. Later, the three Cameroonians and myself left. Before we got to Tamaraset, the part of Algeria that shares border with Niger, we knew we had to be careful because of the police. There were rocks there and we hid among the rocks. At some point, we decided to climb to the top of the rocks. While we were climbing, one of us fell off and died as his body was smashed against the rock surface during the fall to the ground. At that point, we were no longer sympathetic to each other. After about 30 minutes later, another Cameroonian said he was tired. He slumped and died. Only two of us were left. We moved down a bit and met a woman who was on a camel and could understand French. The Cameroonian inquired from her how we could find water and she directed us somewhere, but we did not know the route. “As we moved a bit, we met bandits who took away our bags, clothes and shoes. We pleaded that we were thirsty and needed water. Instead they began to prepare what they called farin – substance that is in powder form like semovita. If you take farin, you will vomit or excrete the contents of your bowels after 15 minutes. It is a strategy used by armed robbers to make sure that their victims do not swallow their money or hide it anywhere in their body. Then they took the 2000 denal I had with me. We told them that we were stranded and had been in the area for six days. They demanded another 2000 denal and the Cameroonian gave them the money. One of the bandits took us to Tamaraset. When we got there, the Cameroonian and I parted ways. I cried because I knew no place there. I was there for four hours before I met one Algerian who understood a little English. The fellow asked me which country I was from and I said Nigeria. He called one Hakeem from Edo State, who told him that he would put me in a bus if I was ready to pay. They put me in the boot and covered me with gallons. When I got to the ghetto called Esan Gheto, they took my clothes and shoes. They gave me farin and water and asked me to call my people. When I called my father, he was upset with me and scolded me for not having told him much earlier that I was already in Libya. What happened was that Sali, the son of the Nigerien woman agent, after abandoning me, went back and told my father that I was already in Libya. He even lied to my father that he spent an additional N40,000 on me. My father rallied round and gladly gave him the money, thinking that it was true. On the whole, my family spent N490,000. I told my father what happened on the phone and he was sad. My people then called the woman agent but she told them not to bother her. She threatened to use her demonic powers to deal with and kill anybody who came to bother her. By this time I was already in Algeria. The Esan people told me to either go back to Nigeria or join the people heading to Morocco. I called my people and told them that I was coming back to Nigeria. But they asked if I could not find a job in Algeria and I told them it was difficult since I did not have my papers that would guarantee free movement and enable me secure a job. Later on, the head of the ghetto told me that Morocco was better. I called my people and told them and they paid N54,000. When we got to a place called Gadaya, the police stopped us. There were 14 of us: four girls, eight males and the two smugglers (gigimen). They ordered us to alight from the bus. When they discovered that we were illegal immigrants, they decided to deport us. They told the other 11 persons to stay at a corner and asked me where my bag was. I said it was in the bus. They said I should fetch it. But when I entered the vehicle, I pulled off my shirt and removed the cap I wore. And blended with the interior. The police waited for a long time, came to the vehicle several times and looked into it, but could not recognize me. They then allowed us to go. While we were going, I shouted and told my co-passengers that I knew nowhere. But one girl asked me to calm down, promising that she would take me to the right people. When we set out, she called agents. They came and picked me and I slept in a ghetto. Hakeem told others to take me to Morocco. When we got to Magnaya, some Igbo people there seized my ECOWAS passport. They later told me I would be going to Morocco by 11pm that night. When we got to Wisda in Morocco, I met Nigerians who had built thatch houses waiting for new entrants they would steal from. They caught me and said I should pay N100,000 before I could be allowed to enter the town. I stayed there and later paid the money after one month. After I paid, I got into Rabat, the capital of Morocco. I was taken to a place called Obi Ndi-Igbo. That is where Igbo rent houses! They said I would serve them for three months before I could be allowed to hustle. After three months, I went to Fez and begged for alms for three months. That is what many Nigerians do there – begging for alms. I was then waiting for the opportunity for what we call striking – that is, sneaking into Europe during the summer. I went to Nado, the boundary between Europe and Morocco. We were four in number; we bought Coca-Cola and bread and slept in the desert for four days waiting for the right moment. There are policemen there because illegal immigrants always go into Europe through there. Having spent four days there, I told others that we should either go in or go back. We then bent and crossed through barbed wires. We beat the genderme (police). We were already on European soil but still some distance when the border police saw us and then alerted the genderme who rushed over and started hitting us with weapons. In my bid to escape, I cut my toes on the barbed wires. I cried but nobody could help me because they could not understand my language. Luckily for me, a Moroccan man who was driving past hurriedly came over and put me in his car and took me to the hospital. He even paid the bills. I later went back to the capital where I treated myself and went back to begging for alms. I was able to save some money, which I used to board another boat with other people – three Cameroonians, one other Nigerian and one person from Chad. I wore my jacket and we went ‘striking’ at 2am to attempt another crossing into Europe. We entered the boat and a few minutes later, a fight broke out. The boat capsized and the three Cameroonians drowned. Some minutes later, Moroccan gendarmes rescued us and took us to prison and tortured us for two days. We were 11 in number; many were arrested at Magnaya. They later deported all of us to Algeria. We went to Wisda and hopped onto a train bound for Nado. But along the way, a board hit one Nigerian from Enugu State; he fell down and died. We cried but there was nothing we could do. We spent two weeks at Nado and later boarded another boat. This time around, we entered Europe smoothly through the waterways but European police arrested us and took us to the police station, where I claimed I was Ibrahim Hamza from Niger Republic. From the police station we were taken to a refugee camp and given ID cards and other things. We were there in Melila Land. After one month, we were taken to Malaga for the final interview. The interviewer spoke to me in the Nigerien language and I responded properly initially. But when he spoke further, I could not understand what he said. I became jittery. I never knew the man was a Nigerian who could speak several languages. He then spoke to me in Igbo, telling me that he understood the prank I was playing. The man was actually a Hausa man but he knew how to speak many languages. I was shocked. After the interview, we saw vehicles lined up for deportees. At the airport, they asked us to say where we were from so that they would give us enough money that could take us home. That was when I said I was from Nigeria and I was given 50 Euros. I left Nigeria on January 14, 2011 and returned on September 3, the same year. That is the story of perilous journey to reach Europe. It was awful. I do not even wish my enemy to go through it. But my worry is that many Nigerian youths are still undergoing the process and many of them die. I thank God for saving my life. After the terrible experience he passed through in his quest to reach Europe and a perceived greener pasture, he advised Nigerian youths who are desperate to leave the shores of Nigeria, warning them to be very wary of people who masquerade as agents. He pointed out that this led to the untimely death of the majority of such youths. “Let them not ever try it. I made a mistake. I made that mistake and it was terrible for me,” he said. “I am now at crossroads as my parents are no longer willing to spend a dime on me. I desperately want to go back to school to complete my studies for the Higher National Diploma, but there is no money. My people who spent all the money can no longer cater for me. I am still waiting for someone who God can touch to assist me complete my education. I am also hoping that help could come to me through the National Agency for the Prohibition of Trafficking in Persons (NAPTIP),” he lamented.